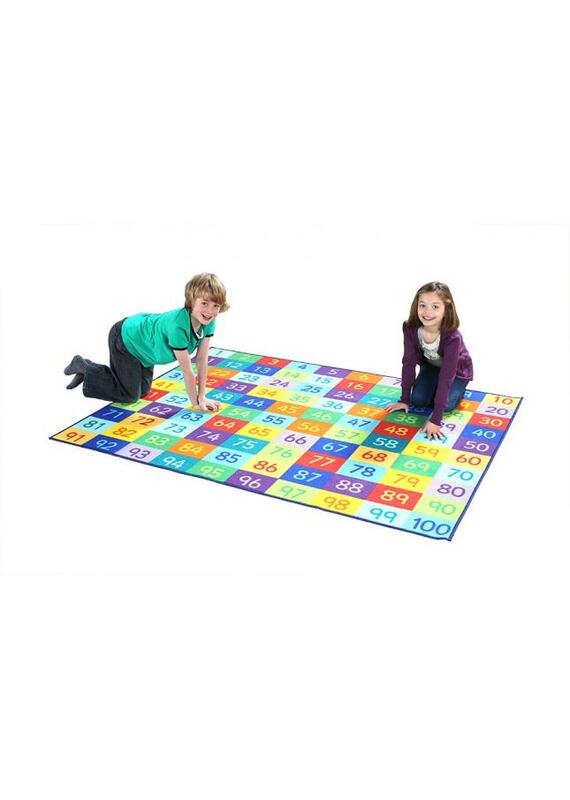 Our Rainbow 1-100 classroom number rug is a brightly coloured 1 to 100 number carpet which is perfect for teaching basic group numeracy. Ideal for use in schools, pre-schools and nurseries this classroom number rug will brighten up any room. Manufactured using a durable tuf-loop Nylon with a robust and soft textured finish. It features a specially designed anti-slip Rhombus backing to ensure safe use on all surfaces. The tightly bound edges prevent fraying and the tuft strands meet heavy duty laboratory pull tests. Our classroom rugs meet essential safety standards EN71 Parts 1, 2 and 3 and comes with a 1 year manufacturer’s warranty. In addition, our classroom mats are crease resistant which allows you to roll up and store it away when not in use, without the worry of long term creasing. Easy to clean, the stain resistant classroom rugs can be spot cleaned with a damp cloth. Also available in Rainbow 1-24 Classroom Number Mat. For more information please Contact us or call us on 01733 511121. View our full range of Classrooms Rugs. Manufactured to order and dispatched within 10 working days, subject to availability.